To develop a hybrid form-based zoning ordinance for the Borough of Clymer to meet PA MPC requirements and to establish community specific standards for neighborhood conservation. 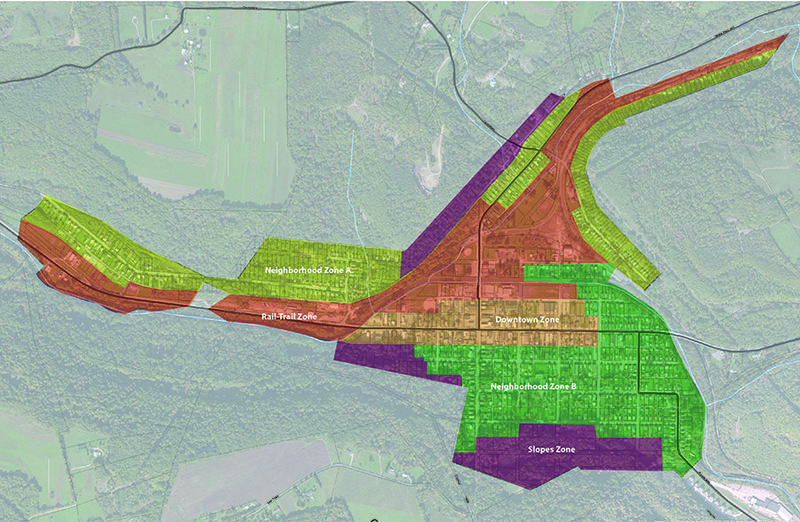 EPD worked with Indiana County’s Office of Planning and Development and Clymer Borough to create a hybrid form-based code that addressed the requirements of Pennsylvania’s planning regulations and the community’s desires. The code preserves the existing neighborhood form that is shaped through connections, blocks, density and streetscape elements that were documented in partnership with Indiana University of Pennsylvania’s Geography and Regional Planning Department. Critical components to the effort were dedicating time to understand the perceptions and realities for the Borough and working to educate the public and elected officials in the creation of the Borough’s first Zoning Ordinance. Public meetings utilized a series of diagrams to clarify ways that future infill development could be guided to meet community needs, preserve property values and accommodate future uses. Sketched ideas in real-time throughout the meetings gave participants instant feedback, fostering understanding between the public and the planning team. The final Ordinance was adopted following a one year process of ordinance preparation and public review. The Pennsylvania Department of Community and Economic Development indicated interest in using Clymer’s code as a model code throughout the State for the implementation of form-based standards within the requirements of the Pennsylvania Municipalities Code.